Happy holidays from all of us here at LCK! This week’s Dinner Plan is filled with my favorite holiday EATS! 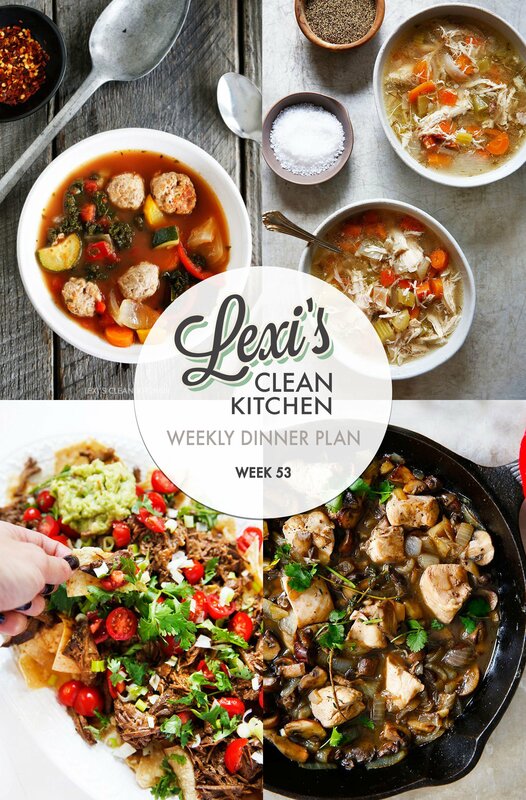 From Apple Cider Braised Chicken to Slow Cooker French Onion Soup, this meal plan will definitely not disappoint! New to the meal plans? You can find them all, equipped with *free* printable shopping lists, in our easy Meal Plan Tab on the blog! If you’ve been loving them, we’d love to hear your favorites so far! Grab your free printable shopping list HERE! 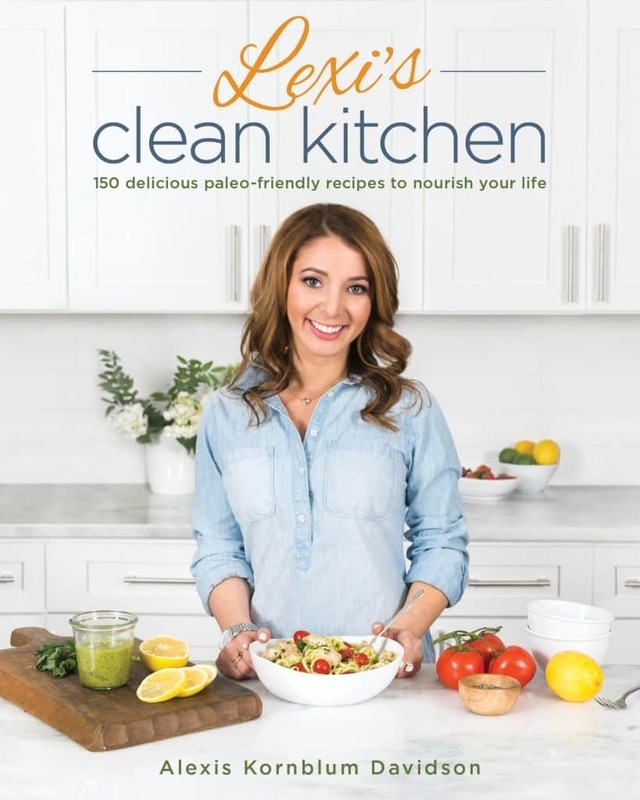 Cook from the Lexi’s Clean Kitchen Cookbook this holiday season! Apps: The Pork Belly Brussels Sprouts with Lemon Dressing on page 236, Spinach Dip-Stuffed Mushrooms on page 116, The Ultimate Meat & Cheese Board, Easy Chorizo and Kale Soup on page 130, Shredded Brussels Sprouts Salad on page 154, Winter Harvest Salad on page 138, and The Best Shrimp Cocktail on page 92 are my go-tos! 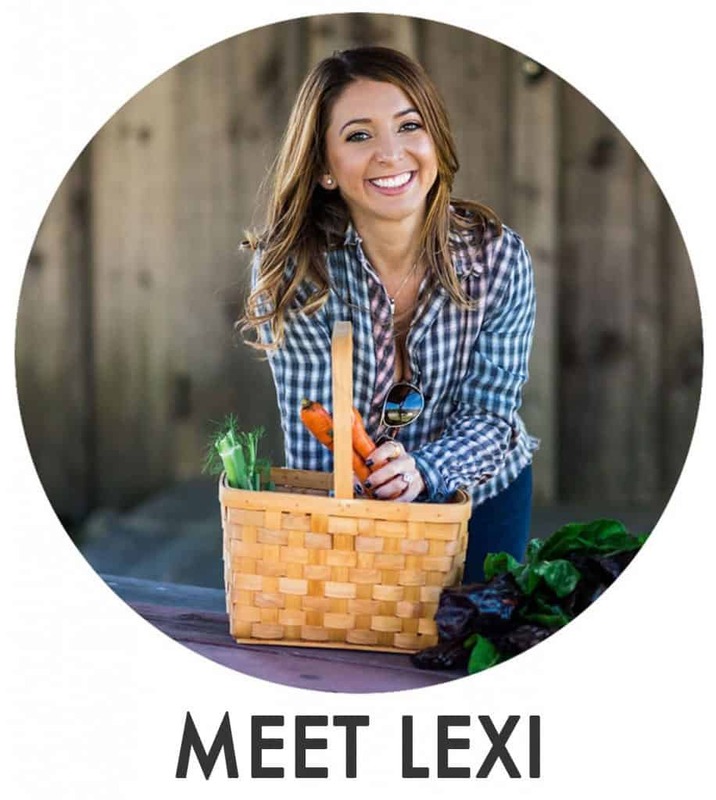 As always, if you have meal plan feedback, please send me an email at Lexi@Lexiscleankitchen.com! I’d absolutely love to hear from you! 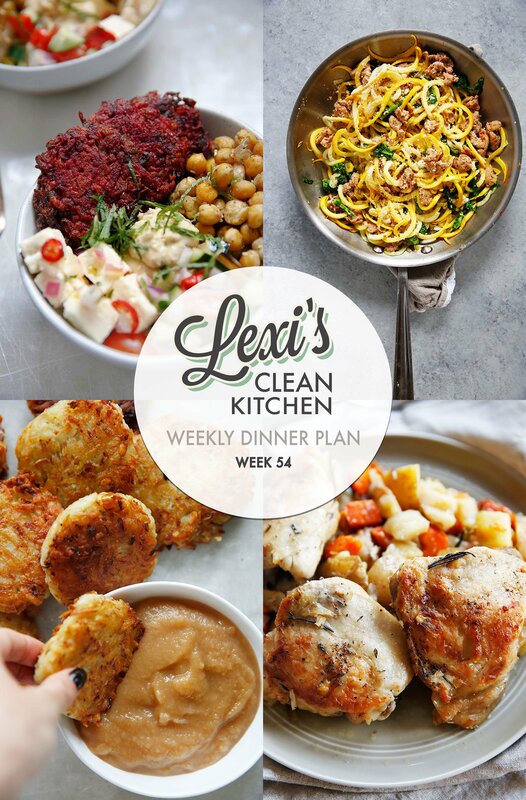 Looking for simple, healthy and delicious meals to make this week? We have got you covered! From my go-to homemade meat sauce with spaghetti squash boats to the freezer-friendly Pecan Popcorn Chicken, this menu is perfect for this busy holiday season! Make some on-the-go breakfasts this week from the Lexi’s Clean Kitchen Cookbook! The French Vanilla Muffins on page 48 are so simple and make for a great freezer-friendly make-ahead breakfast or snack! I also love making a big batch of the French Toast Sticks on page 38 over the weekend and enjoying them as a grab & go option all week long! 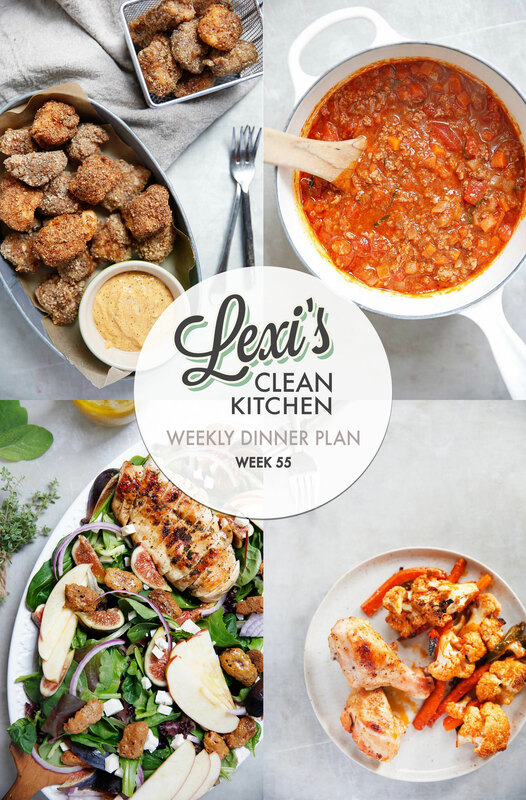 This week’s Dinner Plan is filled with easy and delicious meals that are perfect for the busy week ahead! The Slow Cooker Chicken and Veggie Dinner is one of my go-to simple and delicious comfort foods to make in the fall and winter! It will definitely not disappoint! Happy first week of December! I cannot believe how quickly this year is flying by! December in Boston calls for simple, healthy, and flavorful comfort food! This meal plan is filled with just that! From my reader favorite Slow Cooker Classic Chicken Soup to the One-Pan Chicken in Mushroom sauce, I cannot wait to snuggle up with these delicious make-ahead dinners! 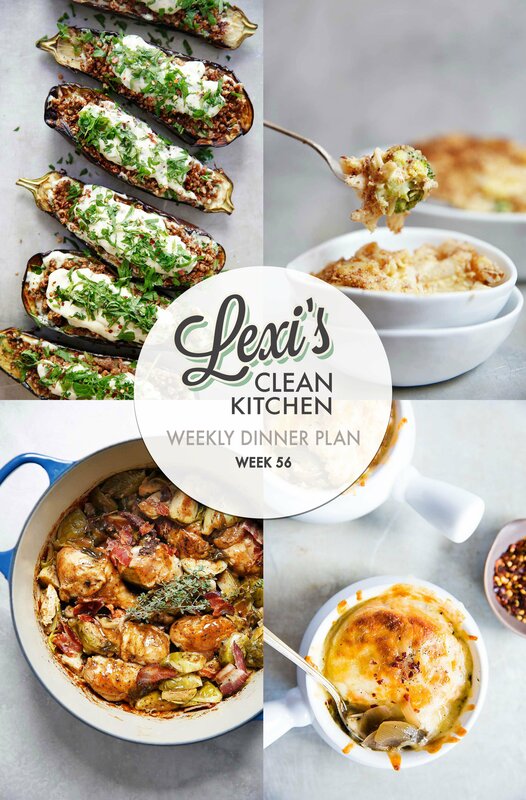 Make a swap this week from the Lexi’s Clean Kitchen Cookbook! The Creamy Chicken Bacon Spaghetti Squash Boats on page 174 and the Chicken in Mushroom Sauce on page 172 make for the ultimate simple and healthy comfort foods! The holiday season is here, which means it is finally my favorite season for entertaining! 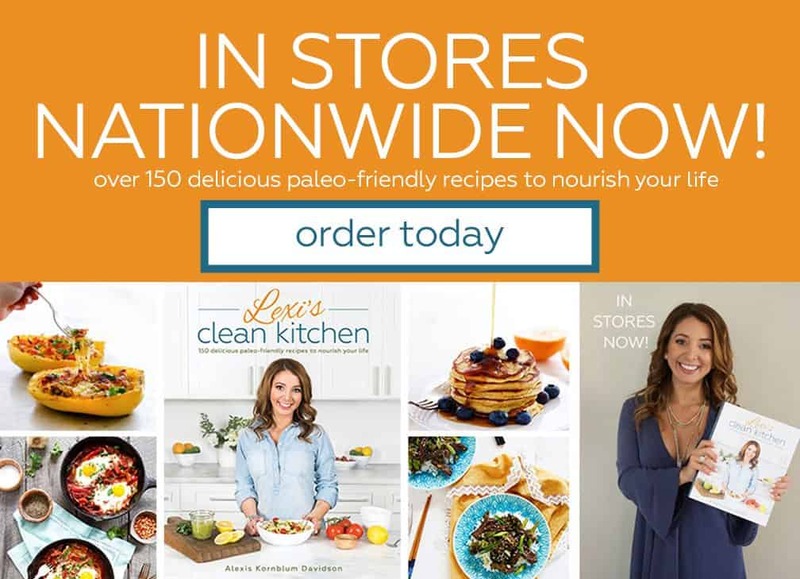 If you are looking for healthy, flavorful, and simple meals to make this season, we have got you covered! From my favorite lamb chops to simple edible gifts you can package for a friend, this is a great guide for when looking for Winter holiday inspiration! 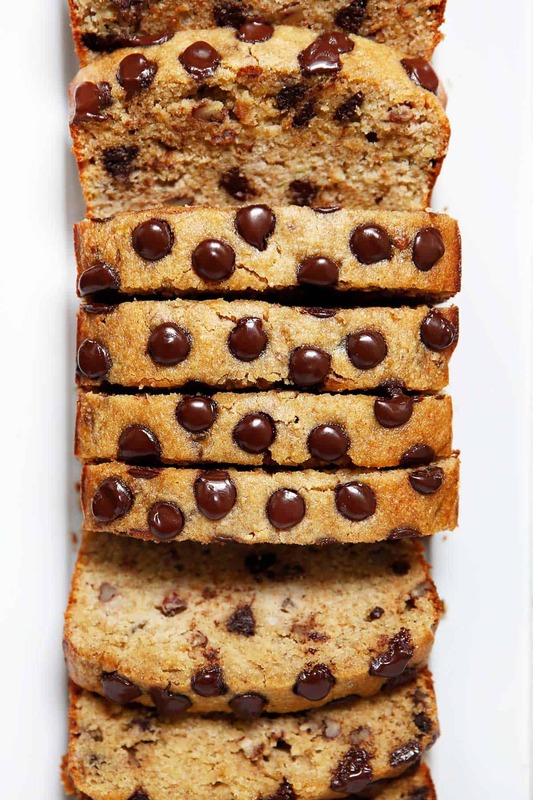 This Paleo Brown Butter Banana Bread is so delicious and moist! 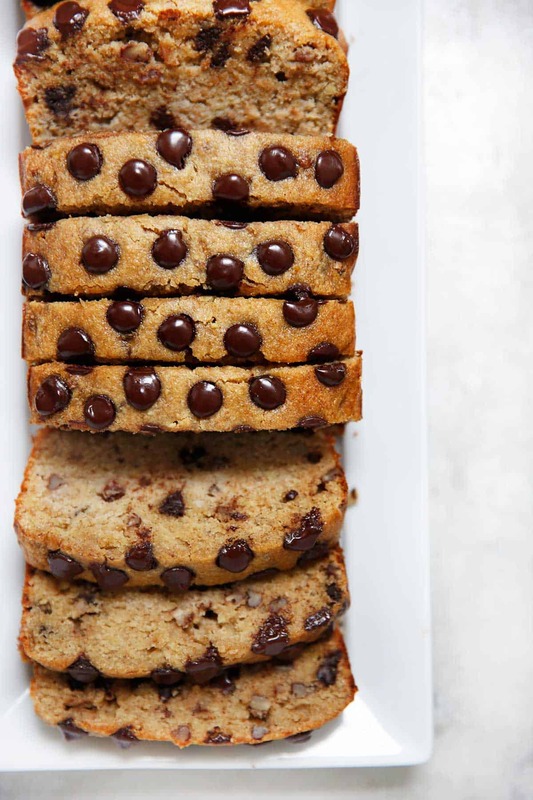 The perfect combination of banana, nutty brown butter, and chocolate chips! It’s taken me years to perfect this recipe, and I finally achieved the exact texture I wanted for the ultimate, easy, paleo banana bread that is freezer-friendly, too! Perfect for a holiday morning, or a snack anytime of the week! Banana bread is such a simple and delicious morning treat. I love how simple it comes together and can’t get over how delicious it smells when baking! Plus, that brown butter goodness is always a game changer! Grab a slice with a cup of coffee or tea, and enjoy! This also freezes so well! If you can’t tolerate butter, use ghee or coconut oil! Pre-heat oven to 350 °F and line a loaf pan with parchment paper. In a small saucepan, heat butter over medium heat until it turns a toasty brown color, about 3-5 minutes. Swirl the pan occasionally to make sure the butter cooks evenly. Once brown, take off heat and pour into a heat-proof bowl to let cool until ready to use. In a medium mixing bowl, stir together dry ingredients. n a separate medium mixing bowl, mash the bananas. Add in the rest of the wet ingredients, including the brown butter when done. Make sure to stir until the eggs turn frothy. Pour the wet ingredients into the dry and mix until just combined. 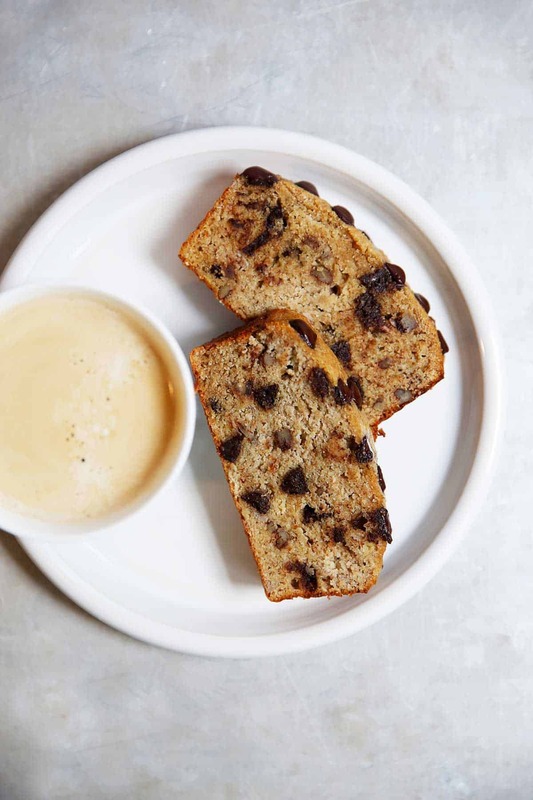 Mix in walnuts and chocolate chips and pour the batter into the loaf pan lined with parchment paper. 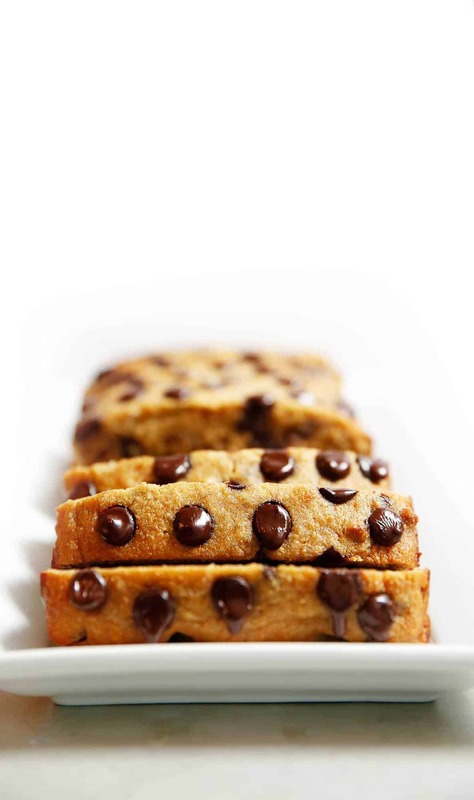 Smooth the top with a spatula and add any additional chocolate chips if desired. Bake for 40-45 minutes, or until a toothpick comes out clean! Freeze for up to 3 months! If you can't tolerate butter, simply sub ghee or coconut oil.